*	50% Non refundable deposit due on enrollment. *	Balance due 2 weeks before the program starts. *	Should a student not be able to attend a specific class date, he/she will still be able to move to the next class within the intake but will not be allowed to finish the Certificate earlier and must be arranged beforehand. The student can complete the module by carrying out the activities at home, and bring in work to class for assessment later on. *	All modules must be completed and assessed before the certificate will be issued. *	If a full payment was made for the course, but a student cannot attend the next upcoming intake, a 50% deposit that was non-refundable will be kept and the other 50% will be refunded back to the student. A notification period of 14 days will be needed for this. *	CuppaCakes by Michelle will only make refunds for special pre-arranged cases and will only pay monies back to clients, 30 days after the arrangement there off. *	Should a class be cancelled and moved to another date within a following certificate intake, a cancellation fee of 25% of the specific module fee can be raised to book another date. This is due to the fact that we could have placed another student at a full rate but have to make way for a rescheduled class. CuppaCakes by Michelle reserves the right to allow students to enroll with the academy but also reserves the right to ask a student to leave the class. Should a student not keep within the rules of the organization, steal, be caught in violent and indecent behavior or damages property or equipment a letter will be given whereby he/she will be asked to leave the premises and discontinue the program without a refund. We are also not interested in training our opposition. Should you be in the same training field as ourselves, within the same industry, your admission could be refused. Please speak to us first should you be unsure of this. •	All our books, recipes, knowledge tests and even templates given to students are copyrighted, and remains the intellectual property of CuppaCakes by Michelle. 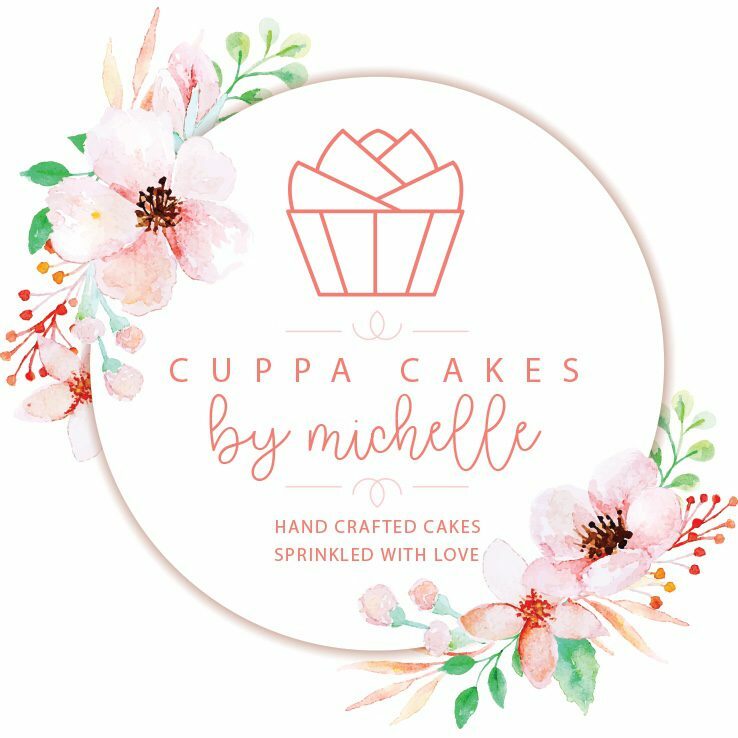 •	Designs and logos remain the property of Cuppa-Cakes by Michelle and may not be published, sold, printed or distributed without our consent. •	NO Videos or photos of tutorials in class are allowed. Students will be given photos after each course, that they are welcome to use in their portfolios, on a social media page or even printed. These photos or any of our course material cannot be copied, or used as another person’s intellectual property. •	Confidentiality is of high importance, whilst in class as well as afterwards. •	Should the student be using our photos or reprint or publish, permission must be given by the owner of these photos first. Always quote under each photo: Photo credit: CuppaCakes by Michelle. *	Please notify us should there be any learning or physical disability that we should be aware off. This will assist us in planning the course layout differently and also ensure that we will be able to assist you. *	If you have any medical conditions like epilepsy or back injuries, please inform us, again so that we will be able to assist you if needed. Our rates will always be announced and adjusted on the website and will be revised yearly in March. CuppaCakes by Michelle reserves the right to change these rates to be adjusted to seasonal and economic factors. •	All ingredients are included as well as fresh cakes or dummies to practice on. **All tools and equipment stays the property of the CuppaCakes by Michelle. Please do not take them home with you. Should an item be broken, lost or needs to be replaced, CuppaCakes by Michelle holds the right to invoice the student for the replacement value accordingly. The course has been devided into 3 skill levels, Basic, Intermediate and Advanced, and 17 separate modules. You may enroll for the whole course, a specific skill level OR separate modules. (The specific modules that are available in separate/single classes and prices are given in your MCD info.) PLEASE NOTE: Advanced modules will require some basic skills and experience, we will not be able to interrupt the classes to explain basic decorating skills. PLEASE NOTE: Advanced modules will require some basic skills and experience, we will not be able to interrupt the classes to explain basic decorating skills. •	No shorts, open shoes, high heels, low cut tops or short skirts are allowed. Please dress in closed shoes such as sneakers / pumps and preferable long or three-quarter pants and t-shirt or closed shirts at all times. If you have a chef’s jacket you are welcome to bring it with. •	When baking and preparing fresh/ raw food, a hairnet or chef’s hat will be provided and should not be taken off during the duration of the class. •	No long or painted nails will be allowed and should be cut shorter / neater for hygiene purposes. Long hair must please be tied back during class. Please refrain from wearing jewelry during practical sessions as it can fall into unbaked goods or get lost. Watches can still be worn but will be removed when in practical. •	All aprons and chefs jackets must be clean and neat at all times. •	No liability will be taken by CuppaCakes by Michelle for any valuables lost. Students will be placed on a cleaning roster for the duration of their time spent at the school. Although each student will be responsible for his/her own workstation every day, the general classroom area will be cleaned by the students as well. Each will get a day on which they should please stay behind to assist with cleaning and tidying up the classroom . We assess the student under the assessment criteria: teamwork in this regard. Please do not leave the classroom leaving dirty dishes and food behind. Should you be late or unable to make the class, please contact us on 0825630707. *	Gift vouchers/prizes are valid for 12 months from the date of issue. *	Gift vouchers/prizes can not be exchanged for cash. *	Gift vouchers/prizes are only applicable on a specific module/class. *	Gift vouchers/prizes may be exchanged for classes of a higher value, on payment of the difference. *	Gift vouchers/prizes will be subject to verification at time of presentation. *	Gift vouchers/prizes that are defaced in any way will be invalid. *	Vouchers/prizes must be mentioned at time of enrolling in the course/module. *	We can not guarantee a nut/egg/allergy free environment during our classes. *	All allergies must be listed during enrollment. *	We see all your information given to us as private, and no data/details will be given to another party without your consent. *	If a mistake has been made or due to unforeseen circumstances, that do not adhere to the course specifications signed by you, we are only liable to the amount of the cost of the specific module. *	No losses beyond this point. *	Please do not bring any valuables to class. No liability will be taken by CuppaCakes by Michelle for any valuables lost. The student will be assessed by the facilitator and be moderated at the end of the course. All Full time students will receive their Certificates at the end of the course period via a small graduation ceremony. Students that were not found Competent by the Assessor within the specific given time, will be re-assessed after a feedback session with the student as well as more time or (paid) classes given to achieve Competency. With enrollment , we will accept that you have read and understood the terms and conditions above, even without receiving your signed terms below.